Just as I expected One Tiny Lie was utterly amazing!! It completely lived up to the first book, Ten Tiny Breaths. Although One Tiny Lie didn't cause me to bawl my eyes out, like Ten Tiny Breaths did, I was 100% emotionally attached, and again just like the first book in this series, I read it all in one day. I absolutely loved hearing about Livie's life now that she is older and seeing her overcome her own struggles. It was a beautiful story and I am so happy I got to read it already. K.A. Tucker has me completely hooked to her writing. Livie's character was awesome, I very easily related to her, and her personality and story was very believable. She felt very genuine and wasn't over done. I thought all of the hi jinks that she got herself into was hilarious and never corny. I love shy main characters who blush easily, probably because I am one myself, and I completely bought all of Livie's self-consciousness. I never thought she was over dramatic or played dumb. Ashton was seriously the best love interest for Livie. He was everything she didn't want, but at the same time everything she needed. I absolutely loved his big ego, his cockiness, and his self confidence. Although every girl will deny it, we absolutely love bad boys and especially the ones who love to tease you till you give in to your true feelings. Although I don't agree with Ashton's cheater ways, I completely get how Livie couldn't stay away from him. He is completely drool worthy, and he's only a book character. Reagan is Livie's roomate and she was a great one. I thought she was perfect for Livie, because she was the right dose of wild, but was still a good and true friend. There were also glimpses of Kacey and Trent, and also Dr. Strayner and it really made the book whole and complete, and true to the series. The pace of the story was also very masterfully done. I didn't think anything was too slow or too fast. I think everything was done at just the right pace. I was never bored or felt like I was being dragged on, the whole time I felt like I was right there with Livie living through it all. All the plot points were excellent and I wouldn't have changed a thing. K.A. Tucker's novels are seriously a work of perfection, and I absolutely love her brand of story telling. Utterly amazing!! K.A. Tucker really knows how to write a great book and she did not disappoint with One Tiny Lie. It was awesome to hear Livie's story now that she is older and going through her own trials in life. I loved how genuine the characters felt and how perfect the story came together. The pace was perfect, the plot points and tension was wonderfully done, and I wouldn't change a thing. I am completely sold as a K.A. Tucker fan and cannot wait to hear what other books and characters she has in store for the future. 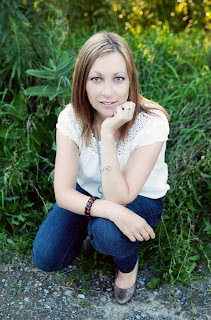 This giveaway is being hosting by InkSlinger PR for One Tiny Lie's release day launch. 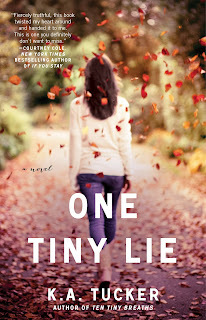 There will be THREE winners each receiving a signed galley of One Tiny Lie. Enter the rafflecopter below to be entered!! I adored book one and was nervous about this one..so glad it delivered and I cannot wait to read it!